Well, not only did Fox not “do that,” they’re putting Dickerson front and center in their FS1 NFL studio programs for the second half of the season. Per an announcement earlier this week, Dickerson, DeAngelo Hall, James Harrison, TJ Houshmandzadeh, Shawne Merriman, Bart Scott, Rod Woodson, and coach Chuck Pagano will all be making appearances as contributors on FS1’s daily studio shows through 2019. The announcement says all of the former NFL personnel will appear regularly on FS1 and FOX Sports’ digital properties. The announcement touts the football accolades of their combined talent, which include 30 Pro Bowl appearances, three Super Bowl wins, two Pro Football Hall of Fame careers and multiple future Hall of Famers. Back when Dickerson joined Fox in 2017, our Andrew Bucholz tried to pinpoint what, exactly, being an FS1 NFL analyst entails. 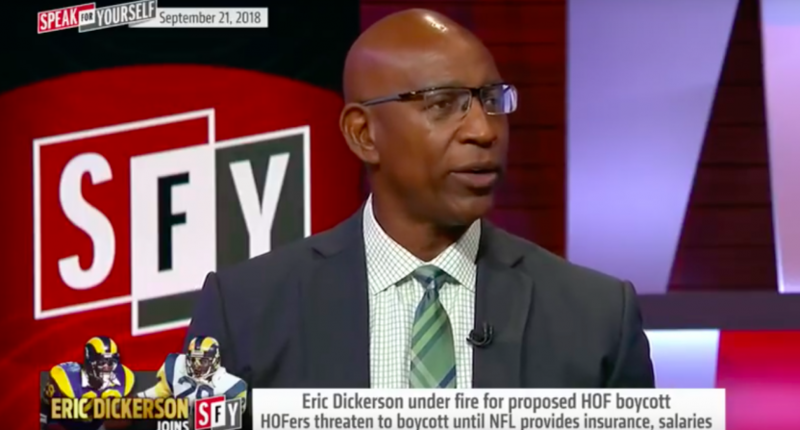 He figured it could be summed up as, essentially, “show up as a guest on our various daytime shows and debate things.” That’s more or less been the case and will likely be the case for Dickerson and the other analysts noted in the release for the duration of the 2018-2019 NFL season.